Kenninji Temple is a gem of a temple hidden in plain sight, right in the heart of Gion. Many walk through the grounds as a short cut without stepping inside to see what is behind the big wooden doors. And they don’t know what they are missing! Established in 1202 this is the oldest zen temple in Kyoto. Take off your shoes at the door and get ready to slide along the wooden floors and be dazzled by treasured works of art and impressive gardens. You can see sliding door paintings dating from the as far back as the 15th century as well as modern works on display. The highlight for me is the moss garden in the back named “the garden of the sound of the tide” but there is no shortage of impressive features at this temple complex. 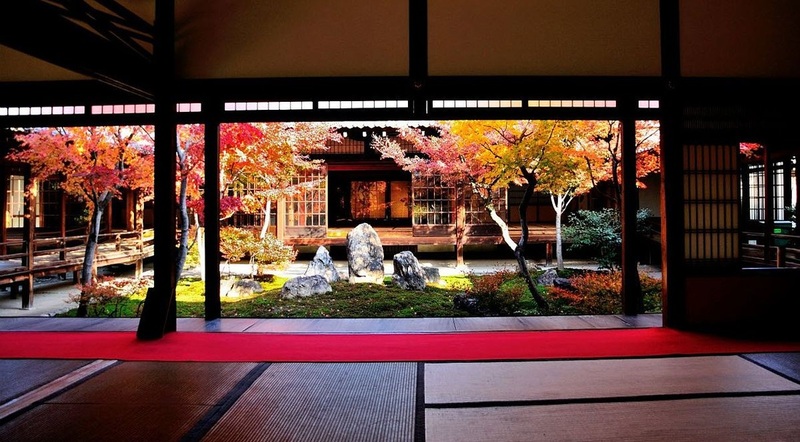 After exploring the view of the art and gardens from the inside you can put on slippers to visit a real tea ceremony house on display in the back giving you an idea of how a traditional tea ceremony would have been held. The larger tea house sometimes opens to the public too and serves a great cup of matcha. This tea house was built by the tea master named Sen no Rikyu a favourite of the shogun and warlord Toyotomi Hideyoshi. Entering the main hall, slowly look up to see two huge dragons painted on the ceiling. These were painted in 2002 to mark their 800th anniversary. These are the most impressive works of art I have ever seen in Japan covering 160m and taking one artist over two years to complete. One of the reasons I love this temple is the rich variety of art and gardens both historic and modern. Add rich heritage and a more peaceful setting than some of the bigger temples and it feels that little bit more Zen. Let us take you there on a guided experience. Click here for bike tours and here for a walk & taxi experience. The view with full reflection while walking towards the temple. When you enter the grounds, you will first walk along the long path towards the place to purchase tickets. Once you have the tickets in hand you can enter the gates and just around the corner is a narrow path when you can get a great view of the temple across the pond. Lots of people here clamouring to get a great photo so you might have to be patient to get a great shot. Now you can walk closer to the building itself and make sure to stop and get a photo of the reflection of the pavilion in the pond. After that, wander behind the pavilion and get a closer look of the phoenix on the top of the building. This is also a replica with the original surviving the fire and now housed in the national museum. Behind the pavilion, climb a few stairs to get to a different perspective of the garden looking down at the top floor with the wooded hills as a backdrop. Not to be missed is a very small and plain looking hut called the Sekka-tei tea hut. This was rebuilt in 1874 based on the original built in the mid 1600's. This is a now classic 4.5 tatami mat design, retains the aesthetic of "wabi-sabi" loosely translated as the beauty of rustic simplicity and longing for completeness. After a look inside you can now wander towards the exit stopping to pray at the sub temple "Fudo-do" and along the way browsing the stands selling many trinkets and snacks. This is a very popular temple in Kyoto so it is recommended to get here early or late to get a less crowded experience. Of course even with crowds it's a very pleasant experience and definitely on the must see list for anyone visiting Kyoto. We can take you there on a guided experience. Click here for bike tours or here for private walk & taxi experience. My name is Niall. Canadian born, Irish in heritage, I now call Kyoto, Japan home and I absolutely love it here. 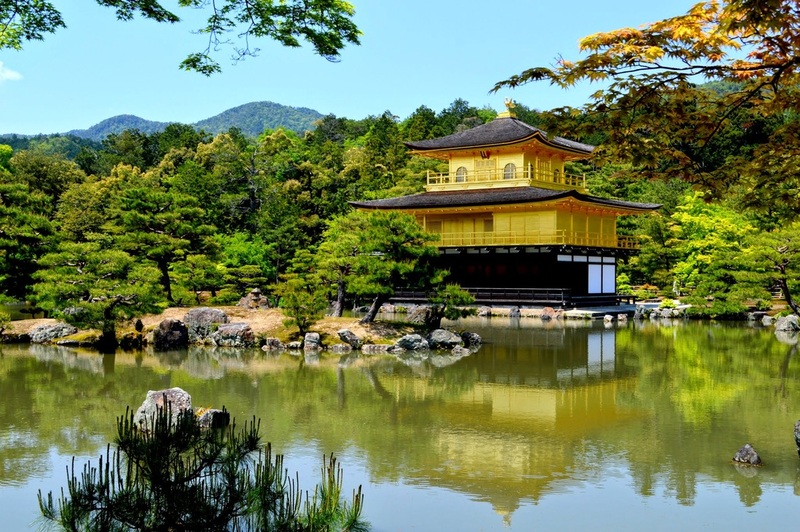 Founder of Kyoto Fun and Japan Adventures, both are dedicated to making for a pleasant introduction to Japan for first time visitors and sharing our knowledge of this great city and country.